I keep hearing about recipes for three ingredient peanut butter cookies. I wanted something a bit more actual cookie texture (think less greasy) and with less sugar than the versions I have come across. So I decided to play with the proportions and I wanted to add some gf flour. I cut the sugar by one fourth and dumped in a small amount of flour. To make sure my results weren’t like a brick I added some baking powder and to keep them from being incredibly crumbly messes I tossed in a touch of xanthan gum. The resulting dough was still a tad crumbly but when you scrunch up about a tablespoon with your fingers it forms a ball that can be flattened with a fork dipped in granulated sugar in the traditional cross hatch of all great peanut butter cookies. The results: simple but tasty = peanut butter heaven. I must advise that I used chunky peanut butter. I don’t much care for creamy peanut butter so I try not to have to buy it for recipes. So I chunked it and my somewhat picky eater who doesn’t like chunky peanut butter was in love with these beauties. I am guessing it would work with creamy. Let me know how they turn out if you make them with a creamy peanut butter. To review, significantly lower in sugar than most three ingredient recipes, great flavor and texture and simple to make. Bonus: they still remind me of the peanut butter cookies of my childhood…which were full of all purpose flour! I used my typical flour blend; King Arthur gf blend but I am sure Better Batter or Cup for Cup will work. If your blend has gum in it no additional gum is needed so leave that quarter teaspoon out. Note: if you love the salty cookie concept, sprinkle with coarse sea salt before baking. Either sweet or salty they are somewhat addictive, especially fantastic with a glass of cold milk. Directions: Mix first six ingredients well in stand mixer. Form into balls by squeezing in hand. Place on ungreased cookie sheet, press with fork dipped into sugar. Sprinkle with coarse sea salt if desired. Bake at 375 for 9 to 11 minutes. Watch carefully – they burn easily. Let stand one minute before lifting off with pancake turner to a cooling rack. Eat and enjoy these gems of cookies…you will be taken back to your childhood. This recipe I recently created is for all the pear lovers out there. I know, I know, pears are under ripe one day and then rotting the next. They are tricky to catch just right. But it’s worth the effort, if you enjoy the delicate flavor of a ripe pear. I used Bartlett pears as that was what I had on hand plus they are quick to use because you can leave their skin on for this recipe. I am a fan of the bosc pear but you usually need to peel them. They also might need to bake an extra five or ten minutes depending on how ripe they are. Only four or five good sized pears make this tart; one more if they are on the small side. They should be somewhat firm but not hard; close to the eating state of ripeness. I used a slight variation on my GF tart shell crust which is from Annalise Roberts’ book; Gluten-Free Baking Classics. It is very easy; hand pressed into your tart pan. I call this is a cookie crust; sweet and slightly crumbly, very yummy. Mix the dry ingredients in a stand mixer, cut in the butter by mixing it at a med low speed until crumbly. Add vanilla and mix well. If it is really dry looking add the tsp. of water. Press into the bottom and up the sides of your tart shell as evenly as you can make it. For this recipe I use a 9 inch tart pan with a removable bottom. I think any low pie pan or tart pan will work. Bake it at 350 degrees for 10 minutes unless you have a bottom heat oven like I do; skip that step if you have a pizza oven. More directions: Slice the pears right into the mixing bowl, cutting out the center core and seeds. Pour or squeeze the fresh lemon juice over the fruit. Mix the sugar, peel and flour and sprinkle over the pears. Turn them over with a big spoon and gently dump the mixture into the crust. Spread it so there an no low spots or high areas. It doesn’t have to look perfect, slightly disarrayed is just fine. Make the crumb topping. Final steps: Sprinkle lots of crumb topping all over your pears, don’t skimp! Bake 35-40 minutes until the pears are soft if pricked with a fork. Do not over brown the crust. This tart might be just perfect with a scoop of vanilla ice cream on the side. Pear heaven for those of us who crave their lush flavor! My dad adored pears – I guess that is where I get my love of them. The cinnamon crust and the lemon add just a touch of complexity to the finished tart. Pie has always been a classic holiday dessert. But sometimes we want something a bit different. Maybe, right now you are frantically looking for an alternative to pumpkin pie or apple pie; they seem kinda ho hum. Look no further, apple pear caramel crumb pie to the rescue! Fresh tasting, locally sourced fruits are exactly in the spirit of Thanksgiving. The apple is the predominant flavor but the pear adds sweetness and a special flavor. The sugars, spices and lemon peel create a yummy caramely sauce. It is not that really sweet caramel of sauces; just enough sweetness to tease your palette. This pie is fantastic with a scoop of vanilla ice cream on the side. I even tried a slice with some sharp cheddar in the British pie tradition; it was nice but I really like it best all alone, so the delicate fruit and spices show their winning flavors. This is the dry blend you mix the fruit slices with before pouring in the crust. Loaded with crumb topping and ready for the oven! This recipe is a blending of my own pie filling and the pie crust and crumb recipes from Annalise Robert’s cookbook, Gluten-Free Baking Classics. 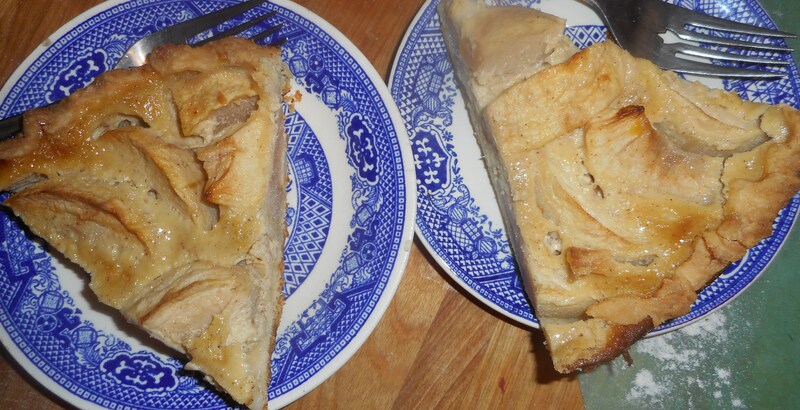 I used less sugar, more fruit, and made a few other changes to create my own special pie using apples and pears. Her cookbook is a fabulous resource and I can’t recommend it enough to anyone trying to bake gluten free for a family member. There is nothing like the classic desserts that we traditionally enjoy at celebrations and feasts to comfort a celiac who can’t eat what they used to. Mix dry ingredients in bowl of stand electric mixer. Add butter and mix until crumbly and resembling coarse meal. Add egg and juice. Mix until it comes together into big chunks. Shape into a ball with your hands. Put it on a crust sized piece of wax paper (14 x 14 inches more or less), flatten the crust ball some; put on top of it another piece of wax paper and chill it all in your fridge 15-20 minutes while you chop the peeled and cored fruit into ¼ to 1/3 inch slices. Roll out pie crust between the two sheets of wax paper; try to get the thickness even, no thick middle! Peel off one side of paper and place in pie pan, centered. Remove other slice of wax paper. Crimp edges all around. Fill with sweetened fruit mix. Sprinkle the lemon peel evenly over top and pour the crumb topping (1 to 1½ cup) evenly over this mixture. The more crumbs the thicker the crust they will form; for a really thick crust use all the crumbs from the recipe below. I put a pie guard under my pies to contain any oven accidents. If you make many pies it is a must. Bake in a preheated 375 degree oven for 30 minutes with a piece of aluminum foil on top of the pie, then 30 more minutes uncovered until bubbly and the crust is light brown. Cool at least 2 hours before serving at room temperature. I discovered this recipe on line, back before last Thanksgiving, at splendidtable.com. I loved the look and sound of it but didn’t find time to make it until last Christmas. Love at first bite. Like a fruit tart and a pavlova had a baby: this is the felicitous result. Light and delicate making it perfect after a hearty Thanksgiving feast. It is really guilt free if you eat it minus any toppings. I devoured it with vanilla ice cream on top at last year’s Christmas luncheon, nice flavor combination. I want to make one for Thanksgiving, maybe this time I will be serving it like you do a Pavlova, with lightly sweetened real whipped cream on top. Yumm! It is really easy to throw together. If you are gluten free you can use the recipe provided below, which I adapted the splendid table recipe to make it gluten free. At holidays like Thanksgiving and Christmas Wegmans often has gf redi-made crusts. So does Frey’s Better Foods in Hellertown. If you are a wheat eater use whatever cookie tart crust you like. I added the cinnamon to my crust and found it added a lot to the complexity of the flavors. The crust absolutely needs to be prebaked before you put the tart together. I should say I seldom use fresh cranberries; I generally make a fresh relish – old family recipe – for Thanksgiving but never got it made last November. So I had the bag of cranberries in the fridge in the fruit bin. Yeah, it sat there a month: I did have to pick through it (you always should) after I rinsed them and remove and squishy ones. There are usually a few of those mixed in and they aren’t great for anyone to eat. Let the picked over berries dry. Anyway, my point is; this tart is fantastic tasting even if you aren’t a huge cranberry fan. I used some smooth raspberry jam (what I had) but you could probably use most any jam. 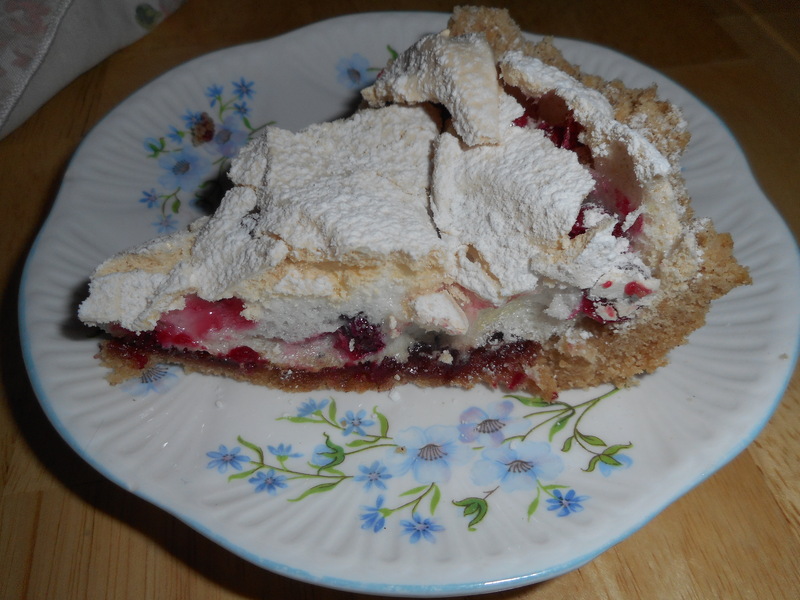 Just chose one full of real fruit in a flavor you like as you can definitely taste the jammy flavor mixed in with the crust and the meringue topping. I loved it with raspberry jam, a favorite flavor for me. Directions: When you’re ready to fill and bake the tart: Preheat the oven to 300 degrees F.
Bake the tart for 1 hour, at which point the top will be light beige and cracked here and there. (If you’d like more color, you can bake it a bit longer or even put it under the broiler.) I did not go there! Transfer the tart to a cooling rack and cool to room temperature. I did cut it while slightly warm and we all thought that was just perfection. 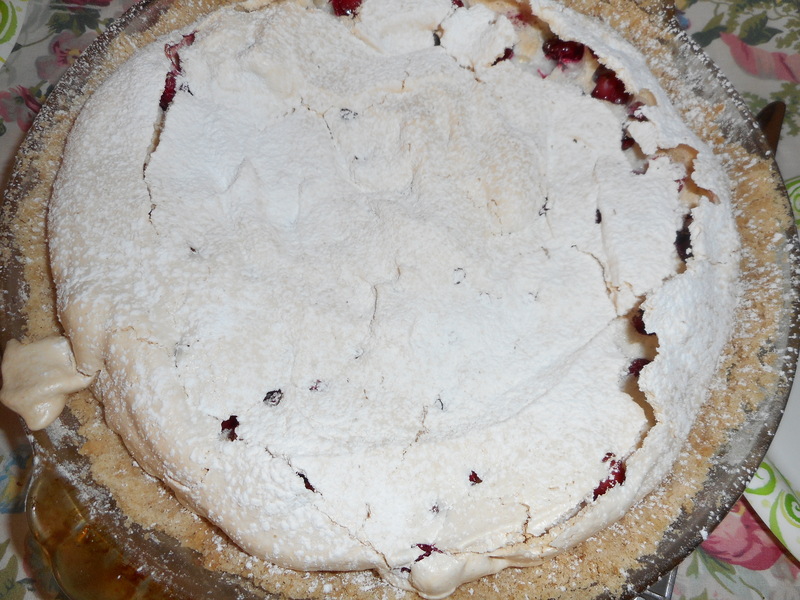 If you’d like, and I do, dust the tart with confectioners’ sugar before serving. Whipped cream on top is also great. Storing: The tart is best the day it’s made, although it’s still pretty nice the next day. Leave the tart at room temperature, covering only the cut part with a piece of wax paper or plastic wrap. I doubt you will have any the second day anyway. It is that tasty. I bought a few new gf cookbooks this past 6-7 months. I have been too busy to do much with my new one by Annalise G. Roberts; she wrote my favorite gf cookbook “Gluten-Free Baking Classics”. In “ The Heirloom Collection” she re-creates many classic recipes we all love but in a gluten free version. Eighteen cakes, thirteen muffins, scones and quick breads, sixteen cookies, twenty breads as well as eleven tarts. And some other misc. baked goods. SO many yummy looking things to bake. All gluten free. And knowing Annalise Roberts, all yummy! She starts with a section on how to take a wheat flour based recipe and make it gluten free; very interesting: I have a few cherished recipes I would love to convert. She is such a reliable and careful baker; all her recipes turn out exactly as promised. With so many great looking recipes and if you have any of her other cookbooks you will definitely want this one. Anyway back to my tart: I was looking for an apple recipe that only needed 4 apples, cause that’s all I had and this tart caught my eye. I had everything but the heavy cream. So I procured a small container and I was good to go. 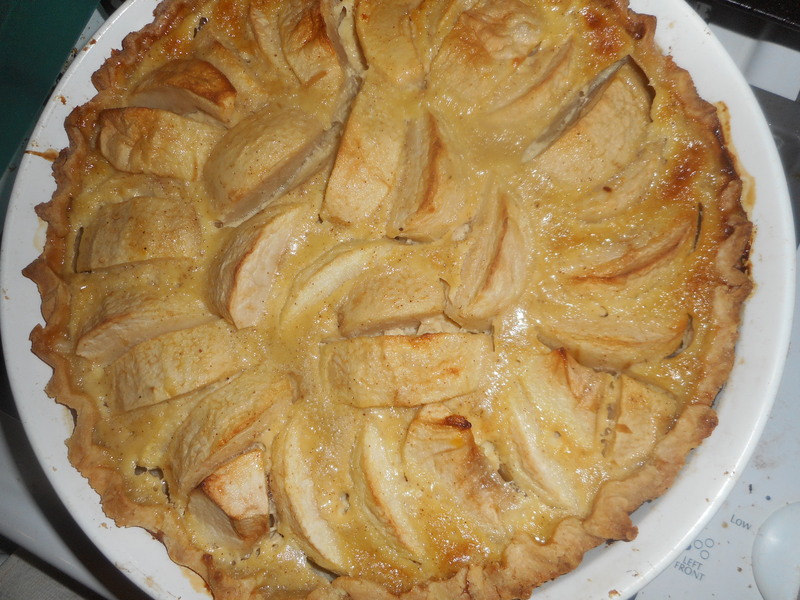 It was a very easy recipe; make the tart shell and while it pre-bakes, peel and slice the apples and mix up the custard. Arranging the apples took me 3-4 minutes and another 30 seconds to pour over the custard and carefully place it in my oven for a transformational baking. 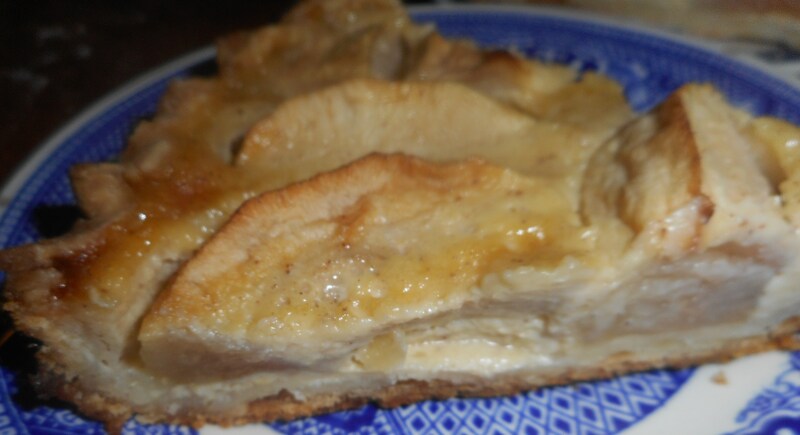 This tart has a lovely texture; the apple slices are soft but held their shape and the custard is silky and subtle. The long baking makes the crust very crisp. No ice cream needed; this is perfect just by itself. After making this tart I noticed that this is the baked good featured on the back cover of the book; a place of honor for a fantastic apple treat. So freaking good; you must try it even if you use a wheat crust. Alsace-Lorraine is an area in Germany close to France; over the years it has been passed back and forth a few times. One of my ancestors is from this area so I was thrilled to find a recipe my great great grandmother might have baked! Spray a nine – ten inch tart pan that has a 1 ½ inch side with cooking spray, set aside. I use a ceramic ten inch pan but if you have one of those tricky deep tart pans with a removable bottom that would work perfectly. Mix dry ingredients in bowl of a stand electric mixer. Add butter and mix until crumbly and resembling coarse meal. Add egg and juice. Mix until it comes together into big chunks. Shape into a ball with your hands. Put it on a crust sized piece of wax paper (14 x 14 inches more or less), flatten the crust ball some; put on top of it another piece of wax paper and chill it all in your fridge 15-20 minutes. Roll out the flattened ball into a pie crust in a pie bag or between the two sheets of wax paper, try to get the thickness even, no thick middle! I like to sprinkle a bit of my flour mix on the crust as it gets thinner so it doesn’t stick to the pie bag/wax paper. Peel off one side of paper and place in the tart pan, be sure to center it. Remove other slice of wax paper. Crimp edges all around. 4 medium-large sized apples, yellow delicious or fuji work well as they don’t squish down too much. I used Fuji; best use for them yet as I find they don’t squish like I want in pies. Add 1 cup heavy cream, 1 tbsp. milk, 1 tsp. vanilla extract, ¼ tsp. cinnamon. Arrange the apple slices in the warm/hot tart shell, squash them close together. Pour the custard filling over the apples. Cool the pie at least 1 hour before serving. You can sprinkle the slices with confectioner’s sugar if you like to guild the lily; not really necessary though. This recipe is from Annalise Roberts’ great cookbook: Gluten-Free Baking Classics – The Heirloom Collection.